Should retail analysis only focus on 'economically active' shoppers? For any retailer, precise and dependable data is essential for accurate retail analysis. Retailers need their people counting data to be accurate, so that they have a clear picture of conversion and opportunity. Some retailers are exploring the possibility of adding 'subjective factors' to their people counting data with the aim of improving accuracy. They are investigating the possibilities of editing their data so that it only includes people who are ‘economically active’. But, does such a restriction actually improve the accuracy of the data for retail analysis? What is an 'economically active' shopper? An economically active shopper is a person who is in a position to spend when they enter a shop. It is a subjective factor which excludes those not in a position to make a purchase, such as young children, from people counting data. As a result, conversion would no longer be a measure of how many people made a purchase from the total footfall. Instead it would be a measure of how many economically active people went on to make a purchase. Why would retailers consider this approach? Why is subjective factoring a mistake? It is possible for thermal sensors to exclude on the basis of height, and therefore remove young children from the data. Yet, this does not necessarily translate to the most reliable data, as it cannot distinguish when a child become economically active. It also ignores other considerations, for example the powerful ‘pester factor’ children can have. Currently, retailers know not everyone who enters their shop is going to make a purchase, regardless of whether they are economically active or not. But by counting everyone, their data doesn't improve (or reduce) conversion metrics based on potentially misleading, subjective factors. 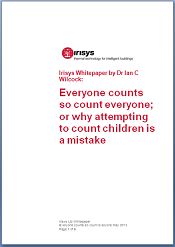 Find out more about people counting and accurate retail analysis in our free whitepaper.